Like most years, in recent history, the Congressional Budget Office’s 2014 Long-term Budget Outlook is not rosy. The bad news is that the future of healthcare costs also looks grim for two reasons. First, the rising age of the US population will increase the burden of health care costs. Second, “the expansion of federal support for health insurance under the ACA, which will significantly increase the number of people receiving benefits from Medicaid and make some people eligible for federal subsidies for health insurance purchased through exchanges (or marketplaces). Further, economic growth in recent years has been fairly anemic and thus health care spending as a share of the economy has inched slowly higher. 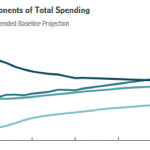 In CBO’s extended baseline, net federal spending for those programs (that is, spending net of offsetting receipts for Medicare) grows from an estimated 4.8 percent of GDP in 2014 to 8.0 percent in 2039; in that year, 4.6 percent of GDP would be devoted to net spending on Medicare and 3.4 percent would be spent on Medicaid, CHIP, and the exchange subsidies. In other words, by 2039 one in 12 dollars generated by the economy would go towards federal government health care payments. Unfortunately, the CBO projections are made assuming that current law is unchanged in perpetuity. However, this is unlikely to be the case. For instance, the sustainable growth rate (SGR) requires Medicare to cut physician payments by over 25%, but this law has been reversed for over ten years in a row. Thus, it is unreasonable to expect that the SGR in its current form will ever be implemented.